Son of a Gun is, for the most part, a seafood restaurant, one where Animal duo Jon Shook and Vinny Dotolo give reign to their less aggressively meaty side. The join only began serving lunch last week, but already the place is mobbed by 1 p.m. Even for lunch, you'll want reservations. 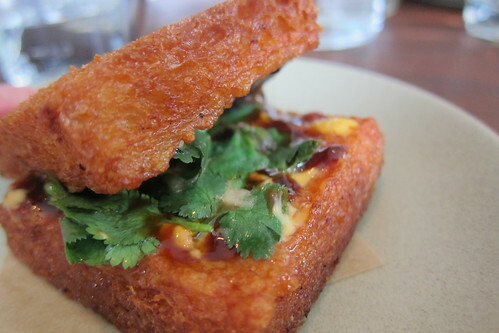 The lunch menu is full of effete, little seafood sandwiches: an oyster "loaf" (read: slider), delicious but miniscule shrimp toast. Unless you like paying $7 for a tablespoon of lobster and mayo atop a brioche the size of a newborn's foot, skip the lobster roll. Following the waitress' advice to order two or three small plates per person is an easy way for two people to ring up a lunch tab of $80. Happily, Son of a Gun's two most affordable sandwiches are also their two best. The fried chicken sandwich ($11), a version of which we were lucky enough to try when Shook and Dotolo rolled with Cart For A Cause, is crisp and tender, a worthy exemplar for Chick-fil-A and its legion of fast-food imitators. It's a hearty sandwich, spilling out its guts of peppery slaw and sweet pickle slivers, all of it accented by a tarted up mayo-and-hot-sauce combo. 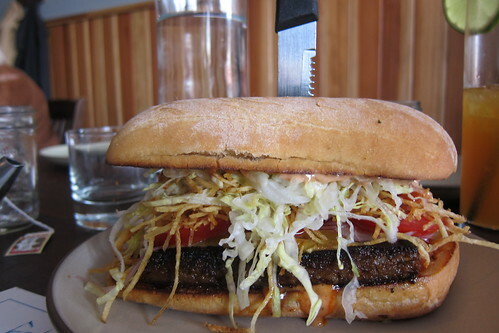 The heart of the Frita sub ($11) is a delicious chorizo patty, full of oil and spice, arriving on a long, toasted, floury roll with a large knife stabbed through its savory heart. Underneath the mound of finely shredded iceberg lettuce and crisp, tiny shoestrings is a slice of tomato and and a layer of melted cheddar. Like the perfect throw rug or arc lamp, lightly sweet "special sauce" ties it all together. 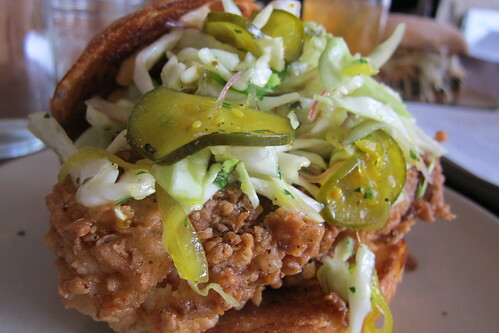 For the glutton on a budget, deciding between the fried chicken sandwich and the Frita sub is a "Sophie's choice." Don't make it. Both are terrific. Order one of each, drink nothing but the 10-cent house water and two people can actually get out of Son of a Gun having spent less than $30 for an exceptional lunch.